This memorial website was created in memory of our loved one, Hans Erni, 106, born on February 21, 1909 and passed away on March 21, 2015. Where Hans Erni is buried? 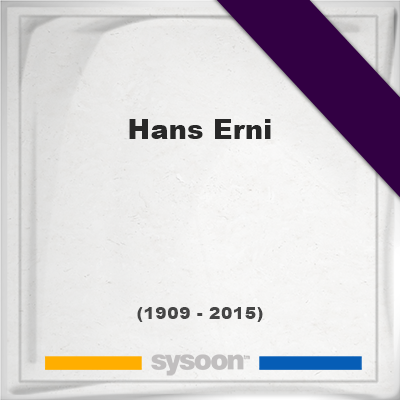 Locate the grave of Hans Erni. How to find family and friends of Hans Erni? What can I do for Hans Erni? was a Swiss graphic designer, painter, illustrator, engraver and sculptor. Born in Lucerne, the third of eight siblings, to a cabin cruiser engineer, he studied art in France and Berlin, and admired artist such as Pablo Picasso and Georges Braque. He is known for having illustrated postage stamps, his lithographs for the Swiss Red Cross, his participation on the Olympic Committee as well as his activism. His 1939 works and first major public success was a mural titled Switzerland: "Vacation Land of the People" was commissioned and displayed for the national exhibition in Zurich. The Hans Erni Museum, situated in the grounds of the Swiss Museum of Transport in Lucerne, contains a large collection of artwork, he also designed ceramics and theatre costumes and sets. He did the art for Swiss bank notes, in the 1940's but, after the notes were already printed they were never published, because a member of the State Council of Lucerne criticized that Erni was deemed as a communist. However, Erni was never member of any political party. In 2004, he was awarded as an, "Honourable citizen of Lucerne". on 10 January 2009 he received the SwissAward for lifetime accomplishment. In his carrier he realized about 300 posters, several murals (for the Red Cross, the IOC, the United Nations, ICAO, and many public and private enterprises). He illustrated about 200 books and created 90 Postage stamps and 25 medals. Note: Do you have a family photo of Hans Erni? Consider uploading your photo of Hans Erni so that your pictures are included in Hans Erni's genealogy, family trees & family history records. Sysoon enables anyone to create a free online tribute for a much loved relative or friend who has passed away. Address and location of Hans Erni which have been published. Click on the address to view a map. Hans Erni was born in Switzerland. Hans Erni died in Switzerland.